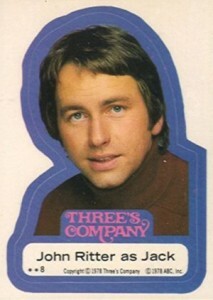 1978 Topps Three's Company trading cards are one of the hobby's overlooked sets. Small in size, the bulk of the set is easy to collect. However, the puzzle card inserts can prove to be a lot more difficult. The series is something of a reversal from most other Topps entertainment sets of the era. Usually, cards made up the main set with stickers being a one-per-pack premium. With 1978 Topps Three's Company, the two are reversed. The base set consists of 44 stickers. They're complimented by 16 puzzle cards that are rarely available individually. Stickers come in a couple of different styles. The first is the trademark Topps character sticker of the era. These have a die-cut portrait of a character with a thick colored border and a white background. This use publicity shots. Other stickers take a similar approach with larger group shots of Jack, Janet and Chrissy. These are also die-cut but with more basic rounded corners. Finally, there are a few stickers that have shots from the show and a small caption. Card backs offer nothing more than visual instructions on how to peel the sticker off. The 16 puzzle cards are all double-sided. The first 15 are used to build the puzzle while the last one is a visual to show what the completed image is. 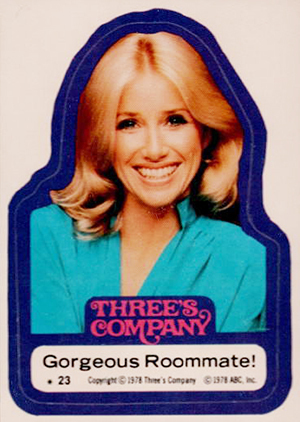 Most 1978 Topps Three's Company sets include only the stickers. Those that have the puzzle pieces command a significant premium. 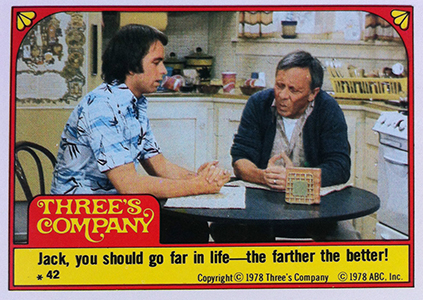 While there have been no official Three's Company cards since, a couple of the main actors do have autograph cards. 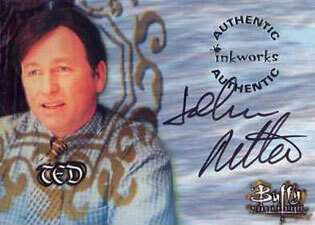 John Ritter (Jack) signed for 1999 Inkworks Buffy the Vampire Slayer Season 2. Joyce DeWitt (Janet) has autographs in a few different sets including 2008 Panini Americana, 2010 Razor Pop Century and 2011 Leaf Pop Century. Suzanne Somers, who played Chrissy, does not have any certified autograph cards, but her replacement on the show, Priscilla Barnes does. Barnes signed for a couple of sets including 2009 Rittenhouse James Bond Archives. 1 Talented Stars of "Three's Company"
5 The Gang's All Here! 20 Having Her Ups and Downs! 24 Chrissy - One In A Million! 25 Three For The Show! 29 "We've finally got our relationship ironed out!" 31 I've got a big surprise for you, Mrs. Roper--the rent! 32 And I Thought All You Could Serve Was an Eviction Notice! 33 Mr. Roper is a man of few words - all of them nasty! 34 I hate to say this, Jack, but there are easier ways to count! 35 I've heard of putting your best foot forward, but this is ridiculous! 36 "Dear Abby, I have this weird tenant..."
37 So I'm a sight for sore eyes, eh? 38 ...Now let's move the couch into the bathroom! 39 Exercising is fine Jack - but can you stretch our budget? 40 Golly, Jack, you make a great centerfold! 41 All girls put me on a pedestal! 42 Jack, you should go far in life--the farther the better! 43 Sure I'll fix your leaky faucet--after you move! 44 Look, dear--Jack can read without moving his lips! This is a blast from the past. These were some of the first cards that I had, along with Star Wars, Battlestar Galactica, and Mork & Mindy. I would buy packs of anything back then! 1978 Topps ABC Three's Company Complete Sticker Set 44 44 NM SHARP! !